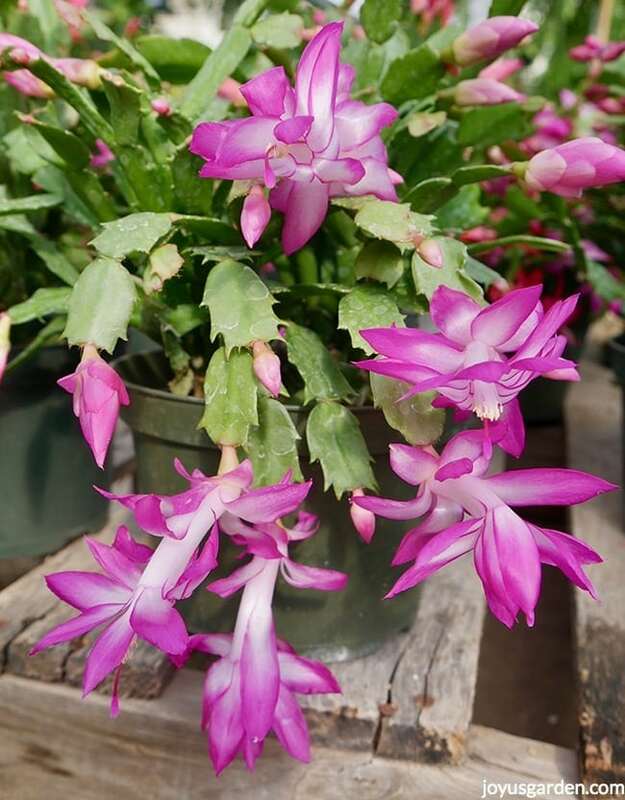 Christmas Cactus (aka Holiday & Thanksgiving Cactus) is a very popular blooming plant for the holidays. It's a long lasting, easy care houseplant you can have for years. 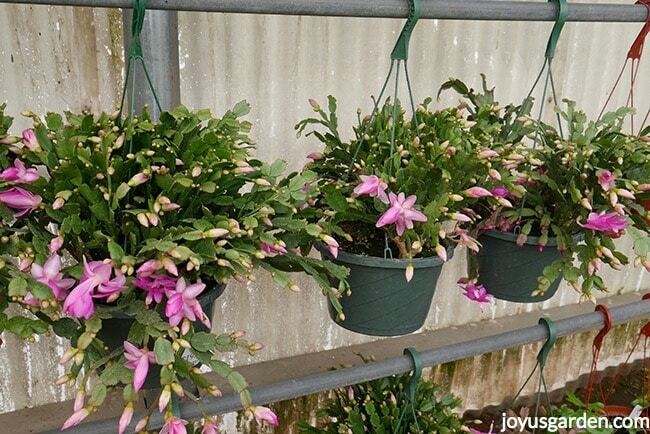 Here's how to grow Christmas Cactus during it's blooming period & after. Plus, find out how to get yours to flower again. Do you want a really cool blooming plant for the holiday season? Well look no further. Christmas Cactus, aka Holiday Cactus, is the one for you. 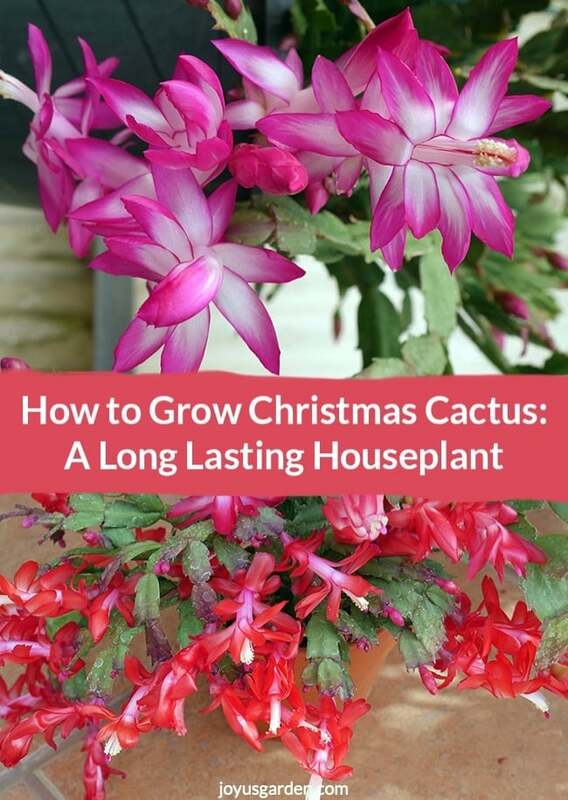 Here’s how to grow Christmas Cactus during it’s blooming period and after. It’s a long lasting houseplant which I happen to find very attractive. First off, let’s get a bit technical for those of you who geek out on all things plant like me. My scarlet Christmas Cactus that you see here and in the video is actually a Thanksgiving (or Crab) Cactus. It was labeled as a CC when I bought it and that’s how it’s commonly sold in the trade. Now days you may see them labeled as Holiday Cactus. 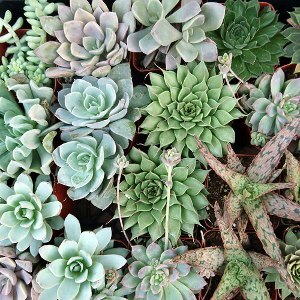 Regardless of which one you have, you care for these epiphytic cacti in the same manner. You can see the notches on the leaves of this white Thanksgiving Cactus. 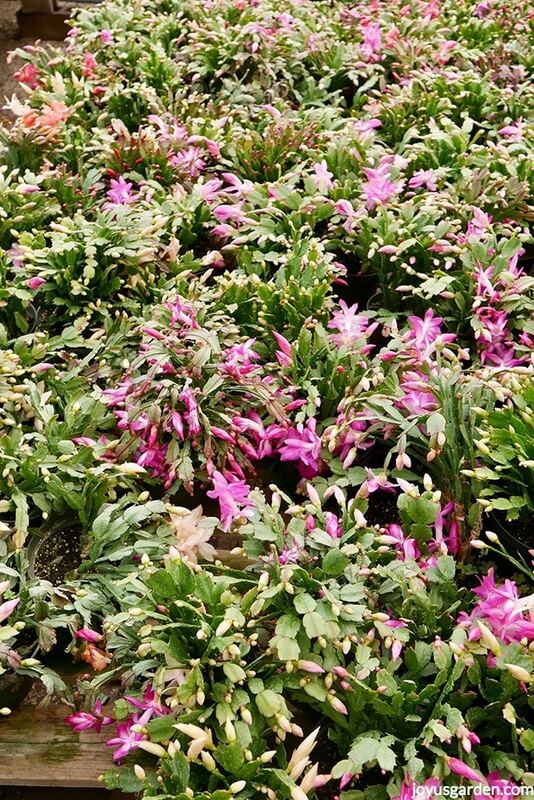 Regardless, it’s being sold as a Christmas Cactus – it’s all about the marketing! Both the Thanksgiving and the Christmas Cactus fall under the genus Schlumbergera which I learned as Schlumbergia years ago. The Thanksgiving Cactus has little spine-like notches coming off it’s leaves (just like a crab claw hence that common name) whereas the leaves of the Christmas Cactus are smoother. 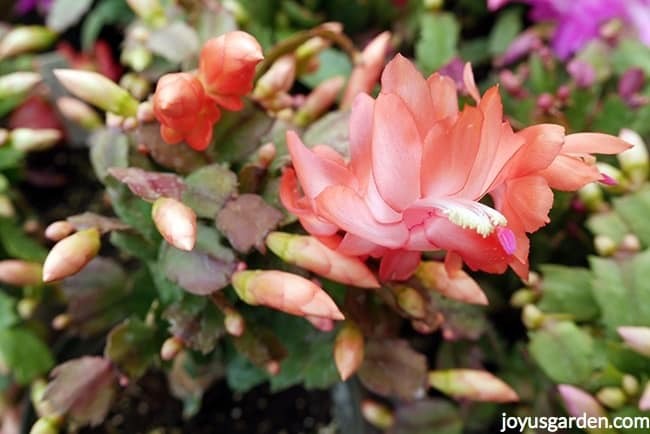 The Thanksgiving Cactus is timed to flower in November/December whereas it’s December/January for the Christmas Cactus. Christmas Cacti are most commonly sold in 4″ or 6″ pots. I’ve also seen them in 6″, 8″ & 10″ hanging baskets. Quite a few years ago I saw one in a greenhouse that was really big – over 6′ wide. Yes, they can be a long lasting houseplant! Hanging pots in grower’s greenhouse. They like & do best in bright, natural light; a medium to high light exposure. Keep them out of direct sun because their fleshy leaves will burn. 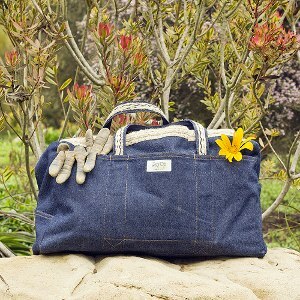 Although they don’t do well in full sun, they do need bright light to bloom & stay looking good throughout the year. These are epiphytic cacti & differ from the desert cacti that I’m surrounded by here in Tucson. In their natural rainforest habits, they grow on other plants & rocks; not in soil. Their roots need to breathe. Give yours a good drink of water, let it all thoroughly drain out of the pot, & let it go dry before you water it again. You don’t want to keep the roots constantly moist or they’ll eventually rot out. How often you water depends on your temps, the exposure it’s in & the pot size. 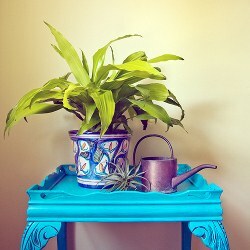 Houseplant watering 101 gives you a general idea. 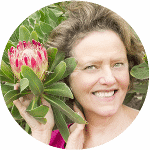 I watered my Christmas Cactus growing outdoors in Santa Barbara every week (yes, they do grow outdoors year round in temperate climates) in the warmer weather & sometimes not at all in the winter, depending on if we had rain or not. Indoors I watered every 2-4 weeks. When your Holiday Cactus is blooming, water it a bit more often. After flowering back off on the watering in winter. You can pick it back up a bit more often in spring & summer if need be. Oh, these violets blooms are pretty. In our homes, they prefer warmer daytime temps (65 – 75) & cooler at night. They actually need cooler temps when setting their buds. Santa Barbara winter temps could dip into the low 40’s or high 30’s & mine were fine. If yours has been growing outdoors for the summer, bring it in before the temps dip. They can’t take a freeze & definitely not snow. It’s Nov 21 as I’m writing this & my Holiday Cactus is already half bloomed out. The temps are currently in the low to mid-80’s so I’m putting mine out at night (currently around 55F) to try & prolong the bloom a bit. Just know that the warmer your house is, the quicker the blooming period will go. Keep them away from any heaters, & conversely, any cold drafts. These are tropical cacti so they prefer some humidity. Our homes tend to be on the dry side so you may have to up the ante a bit with the humidity. If mine starts to look not as robust & a bit on the dry side, I’ll put it on a saucer filled with pebbles & water. Be sure to keep the bottom of the pot out of the water because you don’t want any rotting. I used these bi-colored Holiday Cacti, along with the other plants, to make a make a festive mixed garden. I’ve never fertilized any of mine. I would always amend them with worm compost & organic compost every spring. They always flowered fine. Here in the desert where it’s much hotter & drier, I’ll amend mine again in mid-summer. Yours may not need it but if you like to fertilize, you can use a balanced liquid houseplant fertilizer (such as 10-10-10) in early spring, early summer & mid-summer. My friend used an all-around orchid fertilizer (20-10-20) on his Christmas Cactus once in spring & then again in summer & they looked great. I have quite a few orchids so I may try using that in summer if need be. As I said, Holiday Cacti grow on other plants, rocks & bark – they don’t grow in soil. In nature they feed off leaf matter & debris. This means they like a very porous mix that also has some richness to it. I use mostly succulent & cactus mix (a very chunky local mix) along with compost & coco coir mixed in. This environmentally friendly alternative to peat moss is pH neutral, increases nutrient holding capacity & improves aeration. A bench full of them – want one or two? 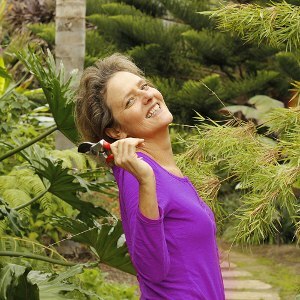 The only reasons for pruning would be if yours needed taming due to spreading over time or if you want to propagate it. Just be sure to cut off whole leaf sections which are easy to identify. Like most succulents, a Christmas Cactus is very easy to propagate. You can do it by leaf or stem cuttings as well as by division. As you’ll see in the video, mine is actually 3 plants growing in 1 pot. I could easily divide them by pulling the individual plants apart or by cutting the root ball carefully with a knife into 3 separate plants. I’d plant them in the succulent/compost/coco coir mix. You can take individual leaf cuttings by pruning the terminal leaf sections off. I prefer to twist them off whether it’s a single leaf or a few sections which to me constitutes a stem. I then heal off the single leaves or stems for a week or so. Into straight succulent & cactus mix they go (with about 1/2″ of the end sticking in) & they start to root in a couple of weeks. I repot them after about a month or so. I find propagation is best done 2 or 3 months after flowering. This peach is another lovely color, especially if you like your plant colors on the softer side. Mine have only gotten a touch of mealybugs (they look like little specks of cotton) which simply I hosed off. They’re also prone to spider mites. Root rots can be a problem if you keep them too wet. The plant starts to whither, wilts & then eventually dies. A very good reason not to overwater this plant. Holiday Cacti, like Poinsettias, are photoperiodic. They require equal or longer periods of darkness to bloom again. So, they need 12 – 14 hours of complete darkness per day. Start this reduction in light approximately 8 weeks before you want it to bloom. Keep them drier; this will help force them into dormancy. Water them anywhere from every 3-6 weeks depending on the temps, the mix it’s in & the size & type of pot it’s planted in. You want to keep the temps between 50 & 65 degrees F. 50-55 degrees is best at night. If your temps are warmer, they’ll require a longer period of darkness. It can take a bit of effort to move yours into a closet or basement every night but perhaps you have a spare room which naturally has these conditions. After the buds start to appear, then you can move them back to a bright spot, resume the care you were previously giving it and enjoy the beautiful flowers. If the buds on your Christmas Cactus are falling off before they open, it could be because it’s too wet or it’s gone through some type of environmental stress (temperature fluctuations, too much sun, cold drafts, etc). I’ve seen the flowers in red, violet, white, peach, & gold. By the way, mine that I’ve grown outdoors bloom on their own. Mother Nature handles the darkness! 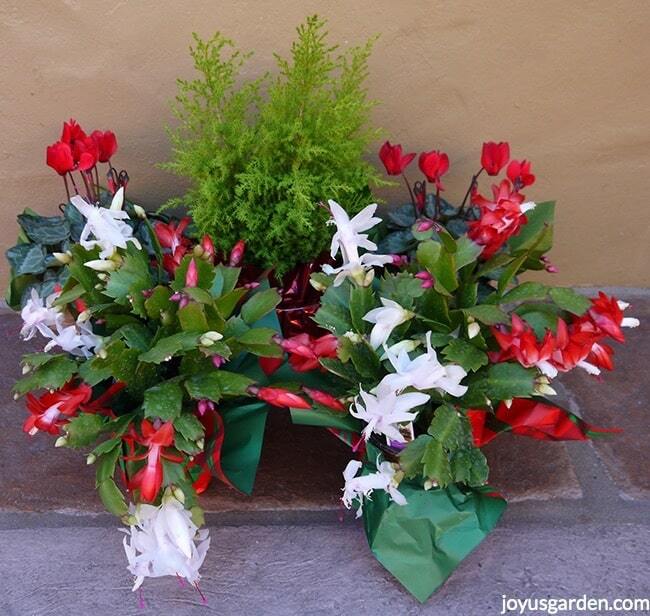 These are very popular holiday plants because of their flowers. They get covered in masses of blooms like mine that you see here. Don’t rush to repot your Christmas Cactus. It’ll bloom better if slightly pot bound. Every 3-5 years is best, depending on how fast it’s growing. Repotting it a couple of months after bloom time is best. 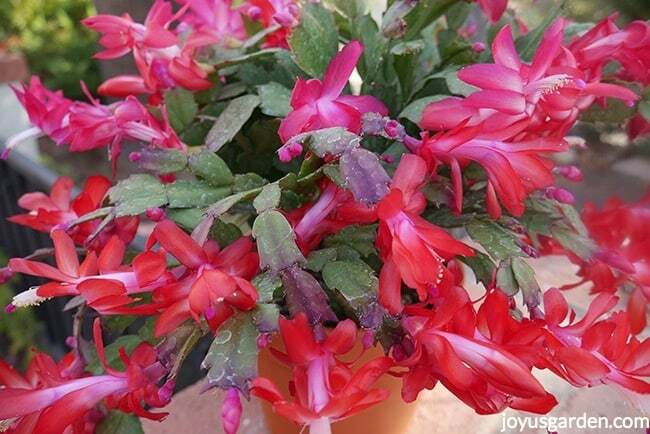 If your Holiday Cactus is changing color, usually to a reddish hue, that means it’s stressed. Common causes are too much sun or too little water. Water yours a bit more often when it’s flowering. If you water one too often, plainly put, it’ll mush out. Conversely, to little water will cause it to shrivel & change color. You can get a Thanksgiving Cactus to bloom a bit later by keeping it cool – 50 to 55F. The flowers will open slower & last longer. Spent flower blossoms can be removed by holding on to the leaf section & gently twisting them off. Holiday Cactus are non-toxic to both cats & dogs. You & your pets can enjoy them with no worries. Here’s a post I did on houseplants & toxicity in regards to our furry loved ones. 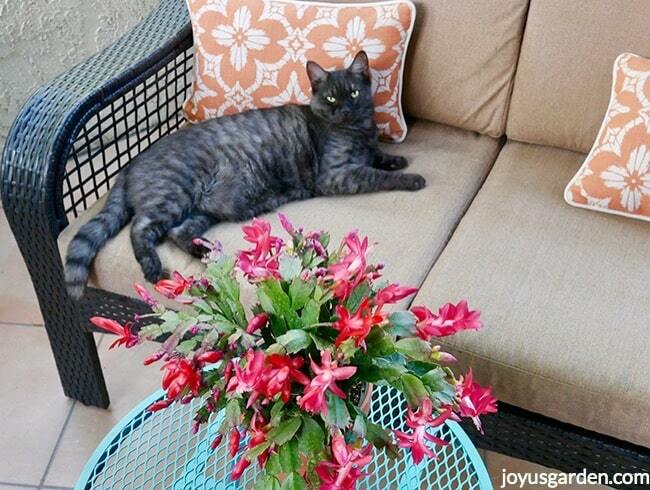 My sweet rescue kitty Riley hanging out on my side patio with the Holiday Cactus. It’s a big plus that they’re safe for pets! The care for Thanksgiving Cactus and Christmas Cactus is the same. 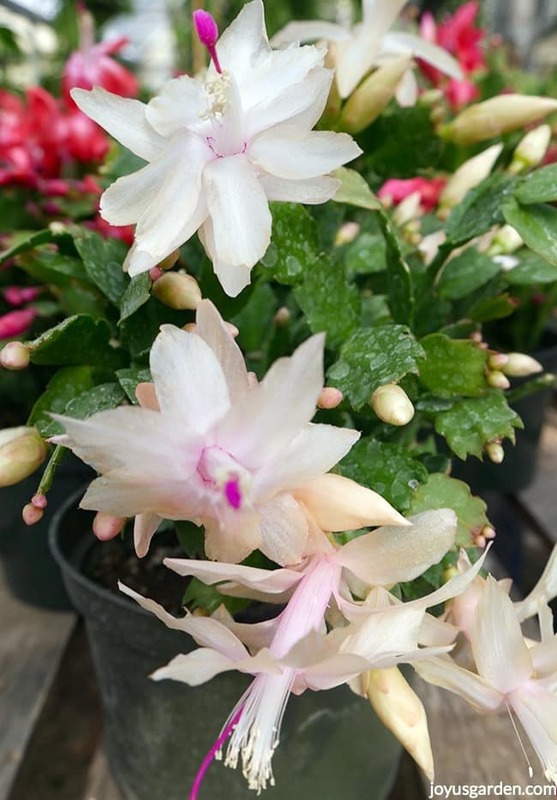 The Thanksgiving Cactus blooms about 3-4 weeks earlier than the Christmas Cactus and is popular because some people want to get a jump on their Christmas flowers. I was also told by a grower that the Thanksgiving Cactus ships easier because it’s not as pendulous and the leaves tend not to break off. Hence, some just call them Holiday Cactus. Whichever one you have, it makes an easy, long lasting houseplant. I think I need (want!) to get another one – how about you? PS: If you are looking for your own Christmas Cactus you can get a red one here. UPS left a gift holiday cactus on my porch, with no warning, and it partially froze., overnight. One side of it seems to be surviving, but the other side has dead, limp leaves. Should I cut these off? I would appreciate any suggestions. My Christmas cactus is about 4 years old and puts on a show when in bloom. Last year, for the first time, I noticed it re-budding, as the blooms were starting to dry out but the buds all dried out and dropped. This year, again, it’s re-budding but the buds look as if they might survive and go into full bloom, is that usual? Hi Carol-I was wondering if these would grow in the water beads.